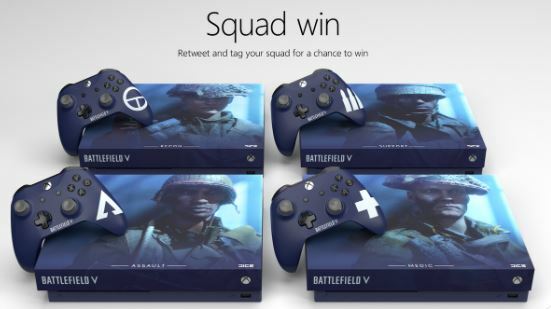 Xbox Canada just launched the Battlefield Squad Contest, in it, you get the chance to Win 4 custom-designed Xbox One X consoles for you and your friends. This contest is open to legal residents of the US and Canada (excluding the province of Quebec) who are the age of majority in their state, province or territory of residence. To enter you need to visit the official Xbox Canada Twitter page and look for the post promoting this contest (you can click here to go directly), retweet it and tag three of your friends. Contest closes at 11:59 pm PT on December 31, 2018. Winner will be selected by random draw from all eligible entries. There is one Grand Prize available to be won, consisting of 4 custom-designed Xbox One X consoles, four copies of Battlefield V, 4 12-month Xbox Live Gold memberships and 4 Xbox hats. The Xbox Battlefield Squad Contest begins at 12:01 a.m. PT on November 20, 2018 and ends at 11:59 p.m. PT on December 31, 2018. The random draw will take place on January 2, 2019. Winner will be notified by a direct message to the winner's Twitter account.